NOTE: Although this series is aimed at small game developers, it is equally applicable to anyone wishing to learn how to use LightSwitch. 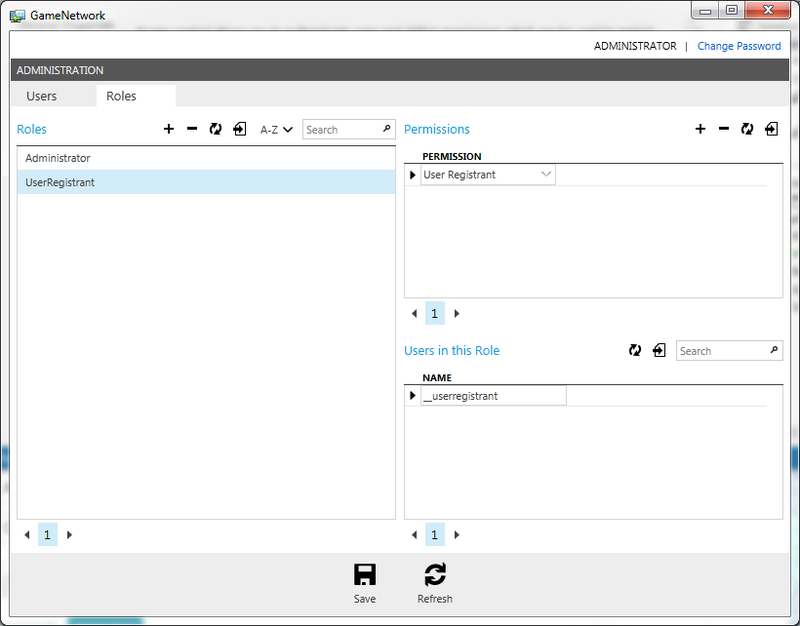 In part 1 of this series we looked at the rationale for using LightSwitch as a game data server and how to setup and publish a LightSwitch project on Windows Azure (optional). In this part, we’ll look at the server-side work needed to enable users to create their own accounts on the game network. We shall take a look at several client-side samples for registering and logging on in part 3 to complete the end-to-end process. NOTE: You need Visual Studio Professional 2012 Update 2 or Update 3, or Visual Studio 2013 (Preview) to complete the tutorials in this article. Note that in Visual Studio 2013 (Preview), the organization of items in Solution Explorer has changed so some items may be in different places to those indicated below. Each table in your database is accessible via OData using an HTTP service endpoint, which is really nothing more than a web page that accepts and returns data in an OData-compliant format. Before you can access these endpoints, you need to be authenticated; if you are using Forms authentication in your LightSwitch project, you can either include the username and password in the URL like http://username:password@yourwebsite.com/endpoint-page or log in using the login page at yourwebsite.com/LogIn.aspx, then your session key will be stored in a cookie (meaning you won’t need to re-send your username and password every single time you access an endpoint). Any attempts to access an endpoint without being logged in are denied (to logout, use yourwebsite.com/LogOut.aspx). Note that when you use the login page, a successful login will present you with an error as it tries to re-direct to a page that doesn’t currently exist in our project. This is nothing to worry about; if you login with an incorrect username or password, this will be shown on the login page itself. The format to use depends on whether your client can deal with XML or JSON more easily, and makes no difference to the actual data itself. You can also submit data using either XML or JSON as you prefer. Using the XPath notation, the actual contents of each row in the XML version can be found in /feed/entry[rowNumber]/content/m:properties/*. As a final example, if you want to fetch the profile (row) for a particular user, you can use the equivalent of the SQL WHERE clause by using an endpoint like ApplicationData.svc/UserProfiles(Id=1234) or ApplicationData.svc/UserProfiles(FirstName=”Katy”, LastName=”Coe”). Notice that for this to work, the field names you use must be defined as keys in the LightSwitch project. All of the general querying (you can think of it as SQL SELECT statements) of your LightSwitch database works like this – HTTP GET queries using OData. There are many, many other things you can append to the endpoints to simulate things like WHERE clauses and so on, and we will explore these in later articles. You can also check out the articles in the References section at the end for the full notation. Much of the point of LightSwitch is to create fast forms-over-data applications; that is to say, you create a table, generate a web page in Visual Studio’s LightSwitch project editor which allows you to enter rows into that table and everything is done for you (these pages are known as Screens in LightSwitch terminology). However, we will be wanting our users to be able to create accounts from within a game’s interface without having to exit to a web browser to do so, so we need to know how to add rows programmatically instead (without a web interface, as we will provide our own in-game interface for registering a new account). Additionally, since we would like to use our LightSwitch application to store online leaderboards and perhaps game state, it would not make any sense to have web pages to edit these tables – they need to be done from the game code in the background, transparently to the user. To add rows (like SQL INSERT statements), you need to use HTTP’s form-posting mechanism, the HTTP POST method. Since browsers always fetch URLs you type into the address bar with the GET method, and since we haven’t yet written a client to insert rows for us, we need to use a tool to try this out. There are many downloadable tools such as WFetch which can do this for you, as well as many online web pages that will submit an HTTP request of your choice and show you the request and response body and headers. Personally I find hurl.it (and the updated version hurl.eu) to be an excellent online tool for this and is what I shall be using in this series. 500 – there was a problem, and the HTTP body will contain an XML-formatted error message (or a JSON object cdata.error -> message -> value containing the same XML-formatted error message if you are using JSON). Of course, we will use APIs when creating our client code that deal with all the business of HTTP, XML and JSON for us, so we don’t need to worry about most of these internal details, and we won’t be constructing the requests and responses by hand. All of this is just to show you how it works under the hood. In the examples below, think of Hurl (or whatever other tool you use) as a simulation of the client code we will write later; we don’t have a client (game) at the moment, so we just use these HTTP tools instead for test purposes, but if you imagine the tool as the game itself, it may help you to visualize and understand what we are trying to accomplish better. So far we have talked about how to query (read) and add rows to an existing table in our application, and doing this has always required us to be logged in as an authenticated LightSwitch user. If you followed part 1, you will have a deployed project with a single user probably called admin. We will want our players to be able to log in to the LightSwitch application as themselves and have read/write access to their own profiles, read access to the leaderboards and a certain amount of write access to the leaderboards and certain other tables depending on the game. We therefore need a way to access the actual LightSwitch user database and add new users. But we first need to understand how users are organized in a LightSwitch application. Assign permissions to roles. 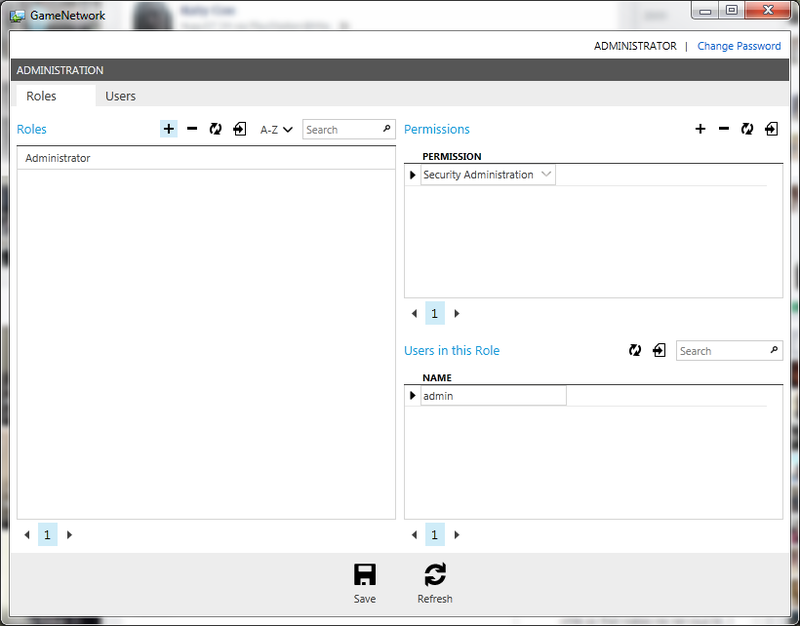 This is done in the RolePermissions table and is again most easily achieved via the user management interface. For the Player role, we will add CanReadLeaderboards, CanAddNewScore, CanReadAllProfiles and CanWriteOwnProfile as the permissions assigned to this role. For the GameManager role, we will add CanEditLeaderboards, CanWriteAllProfiles and CanDeleteProfiles. When a user is created, their username and password will go into UserRegistrations. By adding server-side code to the LightSwitch project in Visual Studio, we will ensure that new accounts automatically have an entry for them added into RoleAssignments to assign them to the Player role. It is very important to do this only with server-side code. If you allow the client-side code to set the user’s role, they could hack the code, change the role to GameManager, create a new user and essentially accomplish a privilege escalation hack which will allow them to delete everyone’s profiles and mess up the leaderboards. If you’re starting to sweat, don’t worry! We will go over how to do all of these things with step-by-step examples in the course of this series! The LightSwitch IDE doesn’t let us edit the user database during development or deployment, and the HTML client also doesn’t provide any interface for administrators. It would certainly be rather inconvenient to have to use a tool like Hurl to configure all the default users, permissions and roles but fortunately there is a solution. 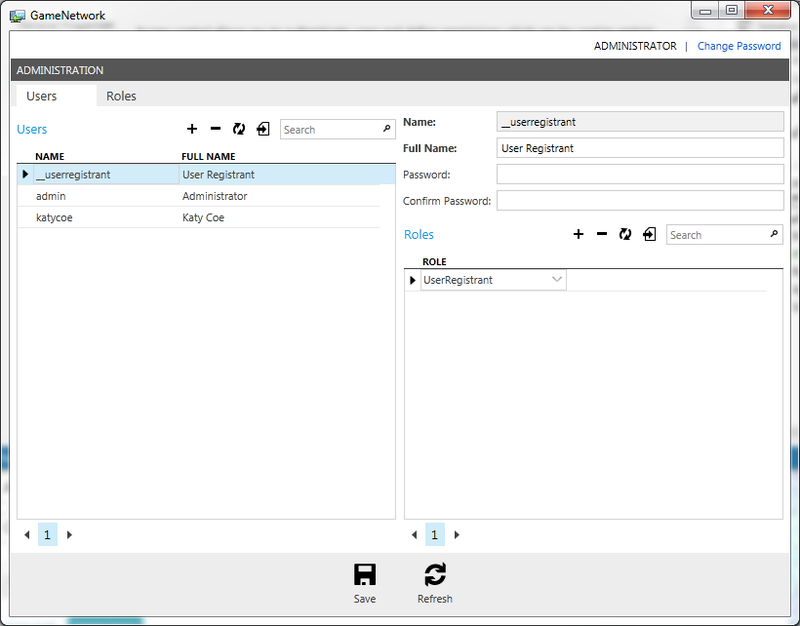 By creating a desktop client for our LightSwitch application, we can access the administrator interface which lets us edit the user database. You will now need to navigate to the Digital Signature tab in the Security Settings section of the publish settings dialog (it will be highlighted with an exclamation mark) and select a certificate. Simply choose your Windows Azure publish credentials file here – which should already be in the drop-down list. Navigate to yourwebsite.com/DesktopClient/ and once Silverlight loads you will be prompted to download and install the application. Click the button and use the More Options drop-down to decide where you want the application shortcuts to be installed (Desktop and/or Start Menu). Once the application has installed, start it up and you will be presented with a standard login screen. Log in as an administrator. You should now be in the administration window. If you click on the Administration menu in the bar at the top, you can choose Roles and Users and you should see screens similar to Figure 3. You can now edit the user database however you wish. Remember that although you can add permissions here, you can and should in preference do that in the LightSwitch IDE in Visual Studio so that the permission names can be referenced in your server-side code. We’ll come back to this interface and add things as and when we need them, but now we shall move on and look at three ways to add users programmatically (and assign them to roles), each with their own pros and cons. If you are logged in as an administrator, you can read and write all user data. If you are logged in as a user without administrator privileges, you can only see (read) your own user data and you can’t write any data. That is, if you try to query the user table to fetch all of the usernames and passwords, you will only retrieve your own. This is for obvious security reasons. As always, you need to remember to supply your administrator username and password using HTTP Basic auth as well, in the same way as we did earlier. Also recall that the supplied password must meet the minimum password complexity requirements (discussed in part 1, along with how to change them) otherwise the server will return an HTTP status code 500 error. The SourceAccountName field is just for logging purposes and specifies which account granted the role to the user. You can set this to anything you want. This is all fine for testing and debugging purposes, but would be horrible if we actually used it in production game code, because we would have to ship the administrator password in every copy of the game, leading to inevitable fast destruction of our server by unscrupulous users. So the problem becomes, how do we add ourselves as a new user when we aren’t authenticated as an administrator, or in fact any user at all, if the application requires HTTP Basic authentication? The answer is to create some kind of limited ‘guest’ user which has a freely available password that we can distribute with the application (and it doesn’t matter if people discover it), but which is only used for adding real new users and has no other permissions. Both of the methods below use this technique to allow users to be added without needing knowledge of the administrator account password. Another problem is that while the user database can only store user names, full names and passwords, any self-respecting game network will doubtless want to store lots of other information about each user, such as their email address, perhaps a location, biography, avatar and so on. Networks like PSN and Xbox Live store information like the user’s total gamerscore. To store this information, we will use a standard table in our LightSwitch application, which solves the problem but leads to another: when we create the user, we may want them to submit their email address and other details in one step, and we have to make sure that both the internal user database and our user profiles table get updated at the same time, with only one OData request. This is for a couple of reasons: first, if we do it in two steps, updating one table at a time, something can go wrong (the user could lose their internet connection for example, or data for one table could be valid but the other invalid) and leave the database in an inconsistent state. Second, we don’t want the game to have to be patched when we change the database design or structure; we just want the game to be able to call some kind of ‘add user’ function and for our LightSwitch server to update whichever tables need to be updated to accomplish this. Our first stab at a solution follows below. WCF RIA is short for Windows Communication Framework Rich Internet Application. Alright, don’t get nervous 🙂 A WCF RIA Service is nothing more than a fancy way of saying a function that you can call on a remote server using the OData protocol. We will create a service with its own endpoint that appears to the client like a regular database table through OData, but in fact merges together the internal UserRegistrations table and another table we will create in our LightSwitch application to store our own customized user profile data (such as email address). You can think of it like creating an updateable view in SQL if you are familiar with that, except since LightSwitch doesnt support these directly, we will have to write some code to accomplish it. NOTE: Take a backup of your LightSwitch project if you intend to try method 3 below, as the steps here will create unnecessary clutter in your project. Start by creating a table in your project to hold the user profiles. Right-click the ApplicationData node in the Server folder in Solution Explorer and select Add New Table.. Create a table that looks like the one in Figure 4. When you create the UserName field, select Include In Unique Index in the field’s properties pane. Add a new project to your Solution called UserProfileManager. Using the project type pane, browse to Visual C# and choose Class Library. Ensure that you target .NET Framework 4.0 when you create the project (there is a drop-down at the top of the Add New Project window where you can change this), otherwise your LightSwitch application won’t be able to access the WCF RIA Service. This will create a new C# class library project that will contain the WCF RIA Service. Delete the default source code file (Class1.cs). Right-click the project and choose Add New Item… Select a Domain Service Class from the item window. Call it UserProfileService and click OK. The Add New Domain Service Class window will appear. Uncheck the Enable client access box and click OK. The domain service class will now be added to your project. This is where the source code for our WCF RIA Service goes. We need to be able to access the LightSwitch .NET classes, so right-click the project again, choose Add Reference…, choose Browse from the left-hand pane, click the Browse… button and navigate to the folder on your system containing the Microsoft.LightSwitch assemblies. For a default install Visual Studio 2012 on 64-bit Windows, this can be found in C:\Program Files (x86)\Microsoft Visual Studio 11.0\Common7\IDE\LightSwitch\Client for example. Double-click the Microsoft.LightSwitch.dll file when you find it and choose OK in the browse dialog to add the reference. In order to work with tables in your LightSwitch application, we must enable the WCF RIA service to access this data. Right-click the WCF RIA service project and choose Add Existing Item… Browse to the folder in your solution containing the automatically generated source code for LightSwitch data sources; in the example project, this will be GameNetwork\GameNetwork\GameNetwork.Server\GeneratedArtifacts. Generally, it will be the folder GeneratedArtifacts inside the Server project folder. Click once on ApplicationDataObjectContext.cs and choose Add As Link from the Add drop-down. This causes the source code to be added to the WCF RIA Service but for the file not to be copied, so that when LightSwitch re-generates it when the available data changes, this is automatically updated in the WCF RIA Service project. LightSwitchApplication.Implementation is needed to allow named access to data sources from your LightSwitch project in the WCF RIA Service source code. This namespace is defined in the ApplicationDataObjectContext.cs file we imported above. Now we have all the boilerplate code out of the way, we can focus on actually creating the service itself. The UserName field has the [Key] attribute which marks it as a unique key (and index) field. We create a public property called Context. This first time this is used, a connection string is built and used to connect to the LightSwitch database. On subsequent calls, the existing connection is used. LightSwitch uses the _IntrinsicData connection string to refer to the database holding the data tables you created in the LightSwitch project. First to note is that LightSwitch will use reflection to find the method with the correct signature for inserting rows, so you don’t need to worry too much about the method name. In the first line, we establish access to the LightSwitch database. We then write new rows to two tables; SecurityData.UserRegistration and our own UserProfiles table. In both cases, this is done by creating a new object of the row type (with SecurityData.UserRegistrations.AddNew() and new UserProfile()), populating them with the desired data and calling SecurityData.SaveChanges() to update the internal user database, and Context.SaveChanges() to update our own UserProfiles table. In this way, we pass in one UserRegistrationView via OData containing the user name, full name, password and email address; the user name, full name and password get written to the internal user database, and the user name and email address get added to our UserProfiles table in a single atomic step, as far as the client calling the OData service is concerned. The attribute [Query(IsDefault = true)] tells LightSwitch that the function to follow is the default SQL SELECT-style query (what OData returns when you call the endpoint with HTTP GET). The function returns IEnumerable<UserRegistrationView> which is nothing more than a simple list of UserRegistrationView rows. The first two lines of the function retrieve the full list of users from the internal user database (SecurityData). Note that this doesn’t scale very well so if you have many thousands or millions of users you will definitely need to re-write this. We now use LINQ to match the user names we just fetched from SecurityData.UserRegistrations with the UserName field in our UserProfiles table and return a mixture of data from both tables – UserName, Password and FullName from SecurityData.Registrations and Email from UserProfiles. When fetching the email field, the LINQ select returns an IEnumerable<string> list so we call FirstOrDefault() on this returned list to just get the first match (string) – there should only be one match anyway. If no match is found, a default value is placed in the Email field (blank in this case). // TODO: Create methods containing your application logic. // TODO: add the EnableClientAccessAttribute to this class to expose this DomainService to clients. In order to expose the service as an OData service endpoint, it needs to be published along with the LightSwitch project, so we need to import it as a data source. First, rebuild the solution so that the WCF RIA Service project’s compiled files are visible to the LightSwitch project. You will see many warnings which you can simply ignore. Once the re-build is complete, we configure the LightSwitch project to consume (access) the WCF RIA Service. Right-click the Server folder in Solution Explorer and choose Add Data Source… Select WCF RIA Service from the window that appears and click Next. Click Add Reference and in the Solution -> Projects tree section, choose the service (UserProfileManager) and click OK. After a few moments, the service should appear in the Available WCF RIA Service classes box. Select it and click Next. On the next page, you will be prompted to select which data sources to import. Don’t be alarmed if you get an error at this point, as the list doesn’t always appear correctly first time; if this happens to you, just click Previous and Next and it should appear correctly. Check the Entities box to import everything (you should see UserRegistrationView with all its fields underneath if you expand the tree). Set the name of the data source to UserRegistrationService and click Finish. 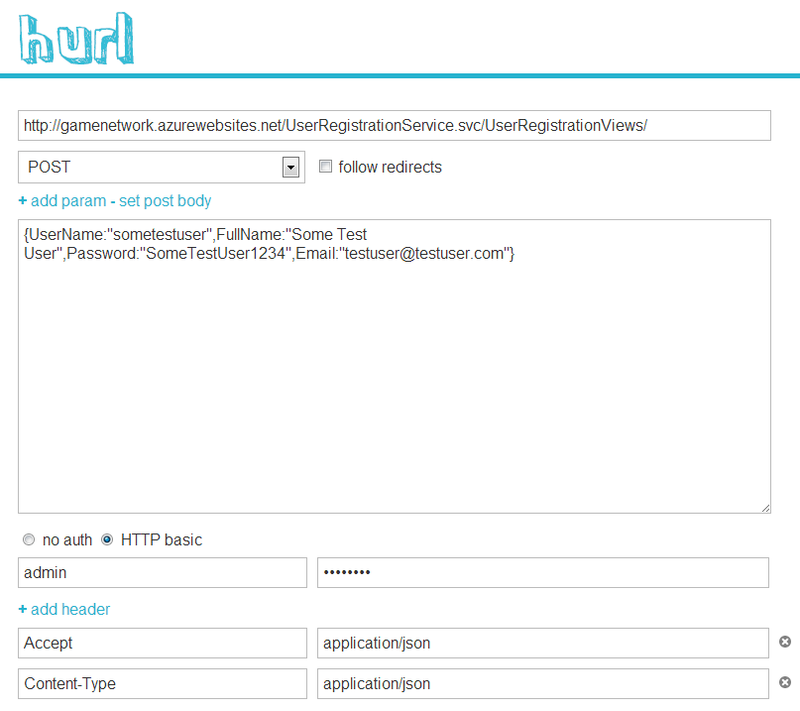 You will now see the UserRegistrationService appear in the Server folder in Solution Explorer, with the UserRegistrationViews table (view) underneath. The service will now be deployed whenever you publish the LightSwitch project. If everything works well and the user is created, the request will return a HTTP/1.1 201 Created status code. At this point, it is still only the administrator who can add accounts, because although any user can currently add rows to UserProfiles, only the administrator can write to SecurityData.UserRegistrations. In the next section, we restrict access to UserProfiles so that only a special public guest account can add new users, and show how to also allow this user to update SecurityData.UserRegistrations. Create a user which we will call __userRegistrant. This will be a public guest user that has extremely limited access. They will be able to add user accounts via the WCF RIA Service and nothing else. We can safely include the username and password for this user into our client code without fear of it being misused to access or change other data in the database (unlike the admin account which gives total access). Since users cannot be assigned permissions directly, but must instead be assigned to roles, create a role which will only be used by __userRegistrant and add the CanAddUsers permission to this role. We will call the role UserRegistrant. Assign the role to __userRegistrant. Write code which checks that the current (acting) user has the CanAddUsers permission when trying to insert data via the WCF RIA Service. Since __userRegistrant will be the only user with this permission, it will be the only user who can insert data (add new users). Write code which temporarily allows __userRegistrant to write to the internal user database in SecurityData.UserRegistrations. Now re-publish the project so that the permission is added to the database. For editing users and roles, we use the desktop client discussed earlier. Open the desktop client (GameNetwork in the Windows Start menu). Open the Administration -> Roles menu and create a new role called UserRegistrant. 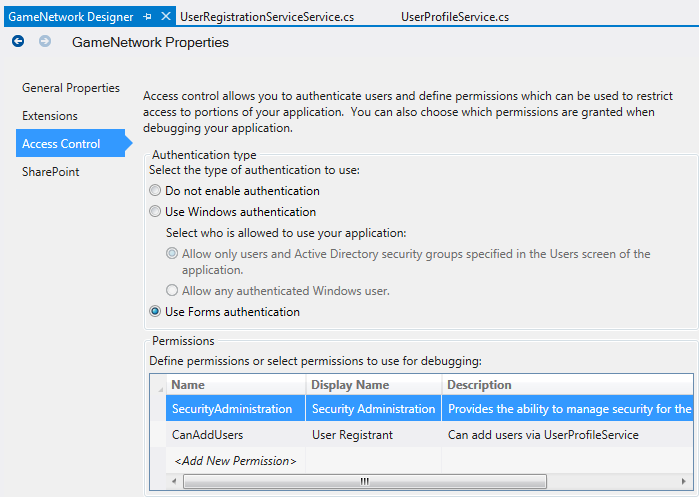 Add the CanAddUsers permission to the role (it will be shown in the Permissions pane using the display name you selected in the project properties when creating the permission). This sets up the role. Now open the Administration -> Users menu and create a new user called __userRegistrant, with the password __userRegistrant, click the + icon in the Roles section and add the UserRegistrant role. Finally, click Save. Now we just need to enforce the CanAddUsers permission. In your LightSwitch project, double-click the Server -> UserRegistrationService -> UserRegistrationViews table in Solution Explorer (the WCF RIA Service data source table). Select the arrow next to Write Code from the Designer toolbar and choose the UserRegistrationViews_CanInsert method in the Access Control Methods section. Visual Studio will create a new function in which you can assign a boolean value to the variable result, which signals to LightSwitch whether the acting user will be allowed to perform an insert operation or not. This method is called when a user tries to insert something in the UserRegistrationViews table, before the insert is performed. If result is set to false, the attempt to insert data will be denied. The Application.Current.User.HasPermission function returns true if the current user has the specified permission, so this check will ensure only users with CanAddUsers (ie. only __userRegistrant) will be allowed to insert data. We also need to allow __userRegistrant to write to SecurityData.UserRegistrations. Since only administrator accounts are allowed to do this, we use a technique called privilege elevation to temporarily give __userRegistrant administrator permissions for the duration of the call to the WCF RIA Service. Once the call ends, the elevated permissions are revoked. Once again, as soon as the insert is completed, any permissions added here are revoked, so this is not a permanent change. Now we should be in business! Re-publish your project and repeat the HTTP test shown in Figure 6. You should find that the account __userRegistrant with password __userRegistrant can add new accounts, but no other account including ones you create and admin itself can add users (if you want administrator accounts to be able to add users, add CanAddUsers to the Administrator role in the desktop client). At the moment, any logged in user can read the entire UserRegistrationViews table (except for passwords). This may sometimes be what you want, but not usually. We especially don’t people to be able to read other users’ email addresses or other personal, contact or payment details. Fortunately, it is easy to restrict UserRegistrationViews such that the logged in user can only access their own profile. The where clause modifies the query result such that only rows matching the name of the currently logged in user are returned, in essence meaning that only one row – the current user’s row – will be shown. If you now visit UserRegistrationService.svc/UserRegistrationViews/ in your browser as a logged in user, only that user’s profile data will be shown. and it all works pretty well. Using the WCF RIA Service spares us from the devastating problem of needing to supply the administrator password to users that method 1 suffers and solves the issue of atomicity of using UserProfiles and SecurityData.UserRegistrations at the same time, allowing us to store more data for each user than the default fields provided by SecurityData.UserRegistrations. IMPORTANT: One security issue to note is that we have not secured the UserProfiles table from being read or written directly, so malicious users can still use this as a backdoor to steal everybody’s email addresses and whatever other data you store there, or modify it. This must be addressed on a production server. Wouldn’t it be nice if we could just do away with WCF RIA Services altogether, and automatically generate new users in SecurityData.UserRegistrations when a new row is added to UserProfiles? We are also yet to address the issue of automatically assigning new users to roles when they are created, so we need to look at that too. Use the desktop client to delete any test users you created. Re-add the CanAddUsers permission in the LightSwitch project properties Access Control tab as it will have been removed when you restored the backup. Delete the UserProfiles table. We will make a new one below. Use the desktop client to delete the (now blank) permission from the UserRegistrant role and re-add the new CanAddUsers permission to it. Use your SQL server interface to drop the UserProfiles table. If you want to tidy up the server, login via FTP and delete the UserRegistrationService.svc file which is left over from the old WCF RIA Service. Leave the admin and __userRegistrant accounts and the UserRegistrant role intact as we will use the same solution for allowing new users to create accounts via the guest account as in part 2. If you skipped part 2, follow the instructions in the Set up a guest user which can add new user accounts section up to the part where you enter source code (it will be different for this solution). When this code executes, a new user will be added to SecurityData.Registrations using the same user name, full name and password supplied when we try to insert a row into UserProfiles. What happens here is that each row of the query results is iterated over. The row is placed in e and then a filter is applied to e after the => operator. If the filter returns true, the row is retained in the query results, otherwise it is discarded. Here we compare the row’s username to that of the logged in user, and only return true if they match. The net effect is that all rows are discarded except the row (profile) of the current user. At this point, we have replicated all the functionality of the WCF RIA Service, but without any extra projects, code or proxy tables/classes. 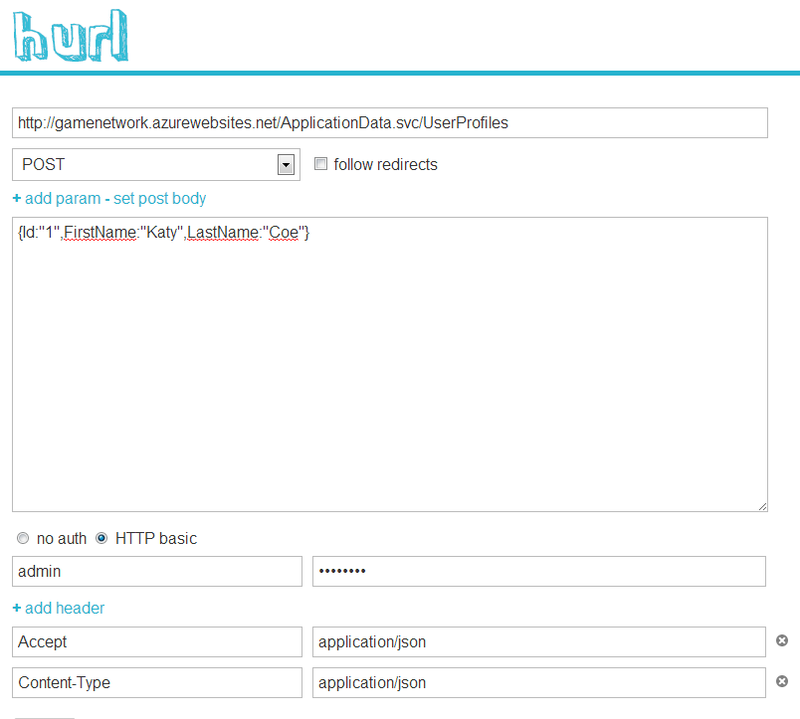 If you re-publish the project you can test it out on the ApplicationData.svc/UserProfiles endpoint. Use the desktop client to add a new role called Player. This will be the default role that new users are assigned to. This assigns the new user to the Player role before the changes are written to SecurityData. Don’t forget to re-publish the project to make the changes take effect. The password will be saved into SecurityData.UserRegistrations when SecurityData.SaveChanges() is called, but after that we change the password field to an empty string, such that when it is written into UserProfiles when UserProfiles_Inserting ends, only a blank field will be stored, and no password. So what’s the downside? In a nutshell, we have two unnecessary duplicated fields – FullName and Password – in UserProfiles. The reason for this is that when you insert a row into UserProfiles, LightSwitch of course expects a value for each field, so having the duplicate fields is unavoidable. As we showed above, the fields can be blanked out with code if desired, but it is still a waste of storage space in the database. Use the administrator account directly. This is the simplest solution but is a security disaster since the administrator username and password must be embedded into your client software (game). It also does not allow the storing of additional user profile data. Use a WCF RIA Service. This provides the ability to merge two or more tables into an updateable view – allowing extra user profile information to be stored with no duplication of data, but involves a lot of technical coding and increases the maintenance and security burden on your application. Use a normal table and write to SecurityData.Registrations automatically when new rows are inserted. This is much simpler to maintain and secure than the WCF RIA Service and also allows extra user profile information to be stored, but leads to duplicated FullName and Password fields in our user profile table. The first solution should be avoided except for development and debugging purposes. Of the last two options, there is no right or wrong solution to use; it just depends on how you prefer to engineer your application. At this point, this may all seem like a lot of extra work compared to just whipping up some PHP scripts that read and write a database for you, however when we add more features to the project later, you will see how the work pays off. In part 3 we shall look at creating a web-based user interface to let the user view and edit their profile, change their password etc. In part 4 we shall look at various ways to integrate the registration and login process to (game) clients written in C++. I hope you found the article useful, please leave your feedback below. Great resource! Thank you Katy! You are amazing!! !…Thank you so much!